Many of you have been inquiring about the treasure hunt Ron Shore spoke about at the division party in May. Today we received a press release about the book and as promised we are passing the information on to you. Good Luck! Vancouver, British Columbia, Canada- The book, The World’s Greatest Treasure Hunt: Quest for the Golden Eagle, will be released February 1, 2010. The grand prize, a $1 Million solid gold eagle, is hidden somewhere in the world. Ron Shore, who lost his sister-in law to Breast Cancer in 2004, created the hunt with a goal of raising $100 million for The Hunt for the Cause, a breast cancer research foundation. This 12 chapter book is a dream for avid puzzle fans. As Ron Shore explains the solution can be found by doing research, watching movies such as The Da Vinci Code and Pirates of the Caribbean and cracking the fun codes, including Sudoku Puzzles, in each of the books chapters. 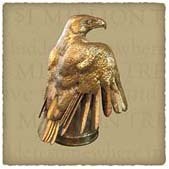 There are 12 individual prizes of a solid silver eagle, valued at approximately $20,000 US and one grand prize a $1 Million solid gold eagle weighing 19.5 pounds. Handcrafted by Canadian artist Kevin Peters, the most unique aspect of this treasure is that it stands watch of the 400 year old 12.73 karat “Atocha Star” emerald, donated by Mel Fisher’s Treasures of Key West, Florida.